Select features according to a percentile of the highest scores. Function taking two arrays X and y, and returning a pair of arrays (scores, pvalues) or a single array with scores. Default is f_classif (see below “See also”). The default function only works with classification tasks. Percent of features to keep. p-values of feature scores, None if score_func returned only scores. 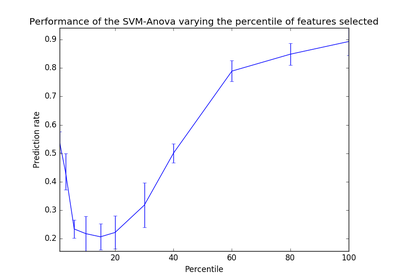 ANOVA F-value between label/feature for classification tasks. Mutual information for a discrete target. 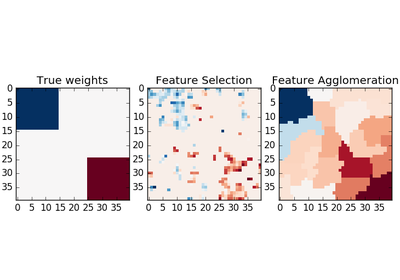 Chi-squared stats of non-negative features for classification tasks. F-value between label/feature for regression tasks. Mutual information for a continuous target. Select features based on the k highest scores. Select features based on a false positive rate test. Select features based on an estimated false discovery rate. Select features based on family-wise error rate. Univariate feature selector with configurable mode. Ties between features with equal scores will be broken in an unspecified way. fit(X, y) Run score function on (X, y) and get the appropriate features. Run score function on (X, y) and get the appropriate features.